Card Text You cannot play creatures. After an enemy creature is destroyed fighting Grommid, your opponent loses 1 . Does Grommid’s ability work when it is attacked? Does Grommid need to survive the fight in order to resolve its ability? What happens if I have Grommid in play and I play a creature via Wild Wormhole (“Play the top card of your deck”)? 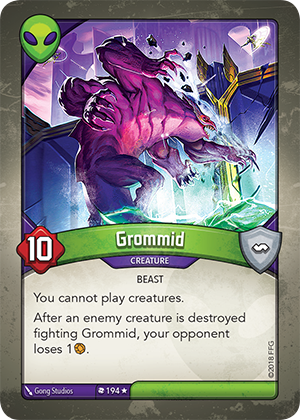 The creature cannot be played because of Grommid, so it returns to the top of your deck.